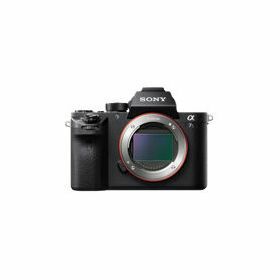 The innovative α7S II features a 12.2 effective megapixel full-frame Exmor CMOS sensor paired with a powerful BIONZ X image processor, allowing it to shoot at a sensitivity range of ISO 50 – 4096004(2) with unprecedented dynamic range. The extra-large pixels on the α7S II collects dramatically more light than traditional cameras to produce beautifully detailed low-noise images in even the most challenging lighting situations. The α7S II is the world’s first5 camera to offer internal 4K movie recording1 in the full-frame format with full pixel readout and no line skipping or pixel binning - resulting in images that exhibit higher resolution and less moiré and jaggies than typical 4K movies. It also provides you the option of shooting 4k in the super 35mm format and the ability to capture uncompressed 4:2:2 Full HD or 4K QFHD output via HDMI to optional 3rd party external recorders6. Enjoy the improved autofocus with 169 AF points and let every lens benefit from the 5-ais SteadyShot INSIDE image stabilization. The α7S II has been upgraded from the α7S and now offers 169 AF points for fast, precise focusing with greater accuracy compared to the original α7S. The low signal-to-noise ratio produced by the image sensor of the α7S II enables the Fast Intelligent AF to detect contrast more easily and react speedily even in low-light situations (as low as EV-4), when it’s even tough to check focus with the naked eye. The AF performance on the α7S II is also twice as fast as the α7S during video shooting. The 5-axis SteadyShot inside image stabilization system is fine-tuned for 4k video capture. It accurately compensates for blur caused by camera shake from five different directions—vertical, horizontal, pitch, yaw and roll—as opposed to only two in previous systems. The 5-axis image stabilizing system excels during video recording and even compensates for blur caused by the user walking or running. It’s a true marvel of engineering. You can even monitor the stabilizing effects of camera shake compensation in the viewfinder or LCD screen while shooting still images by pressing the shutter button halfway or magnifying the image, and while shooting movies by entering movie mode. The α7S II offers the option of user selectable compressed or uncompressed 14-bit RAW still image. Uncompressed 14-bit RAW maximizes the benefit of the image sensor's wide dynamic range, delivering the smoothest, richest color quality and tonal gradation while compressed RAW offers more convenient file sizes. For the first time ever in the Sony α7 series camera, the α7S II can support high frame rate 120fps shooting in full-HD resolution (1920x1080) using the entire full frame sensor. Video can be saved in Full HD resolution as 1920x1080/120p at 100Mbps3 or as a convenient slow motion footage as 5x 24p at 12mbps or 4x 30p at 16mbps. The α7S II boasts numerous features, common to Sony’s range of professional video cameras that enhance a cinematographer’s ability to capture breathtaking video while benefiting their workflow. Video functionality has been enhanced with new picture profile settings; S-Gamut3, Cine/S-Log3 and S-Gamut3/S-Log3, simplifying color correction and delivering wide dynamic range (up to 1300%). The α7S II even offers impressive 14-stop latitude in the S-Log3 gamma setting, while also supporting other popular profiles for cinematographers including S-Gamut/S-Log2 that can adjust settings like gamma, black, level and color adjustment, and can be saved for use in a multi-camera shoot. Other enhancements include the addition of Gamma Display Assist, a new function that allows users to pre-visualize the post-graded video when recording S-Log movies, and the improvement of the Zebra function for even greater control. The XGA OLED Tru-Finder in the α7S II has been upgraded with the world’s highest viewfinder magnification (7) of 0.78x (roughly 38.5 degrees in diagonal field of view) and shows clear images across the entire display area. The use of ZEISS T Coating ensures sharp reduction of reflections on the viewfinder. Unlike an optical viewfinder, the OLED Tru-Finder can be used to instantly show how exposure compensation, white balance and other selected settings are affecting the displayed image. The α7S II ‘s shutter includes a new braking mechanism which cuts mechanical front/rear curtain vibration by about 50% (2). Additionally, you can use the electronic front curtain shutter mode for even less vibration. This not only minimizes camera shake that can blur details and also reduces noise. Silent shutter mode eliminates shutter activation entirely for completely silent shooting. The new shutter mechanism on the α7S II is extremely durable having being tested to 500,000 cycles8. Simple connectivity to smartphones via Wi-Fi/NFC (9). Thanks to built-in Wi-Fi, you can easily connect to a compatible iOS or Android smartphone or tablet with the free PlayMemories Mobile App. From there you can control your camera, preview and frame using your mobile device and trigger the camera shutter or movie button. Then instantly transfer a photo or MP4 movie to your device. NFC (Near Field Communication) provides 'one-touch connection' convenience to Android smartphones and tablets with NFC. Simply touch devices to connect. Setting up your mobile device is as simple as downloading a free PlayMemories Mobile app. Personalize your camera with PlayMemories Camera Apps (4). Add new features to your α7S II with PlayMemories Camera Apps4. Find apps to fit your shooting style - with everything from time lapse, motion shot and more. Use apps that shoot, share and save photos to your smartphone using Wi-Fi, making it easy to post photos directly to your favorite social media site or backup images to the cloud without connecting to a computer. Directly compatible with the growing family of E-mount lenses, the α7S II can also be used with Sony’s A-mount and others lens systems with optional adapters10. Sony’s complete α lens system includes several premium offerings from Carl Zeiss and G Series Lenses. Sony’s E-mount lens system is particularly well-suited for video shooting, with a variety of models containing 'movie-friendly' features like smooth focusing, powered zoom control, and silent iris/aperture control. 5-axis image stabilization lets you enjoy unparalleled handheld shooting freedom with more of your favorite mountable lenses.